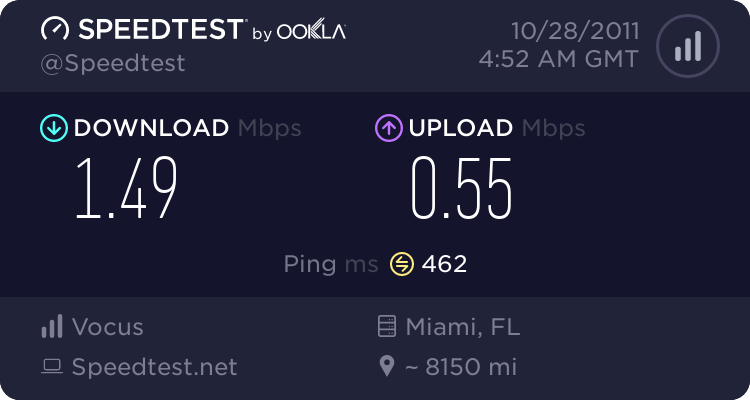 mattRSK: Currently not connected as I reset the router and updated my details for the slingshot account. Router log shows PPP error, contacted Slingshot who have said it will be working by this afternoon. Hey if you haven't I would call them up and let them know. Something to do with notifying the provisioning team? I have had two emails, one saying connected and one saying active. However no connection yet. Yeah I already called them up, but they said it will take sometime, could be today or in the weekends. PM your account number to me and one of our techs will take a look into your issues and give you a call. *Edit* Within 10~20 minutes I got a call and everything is up and running, cheers! 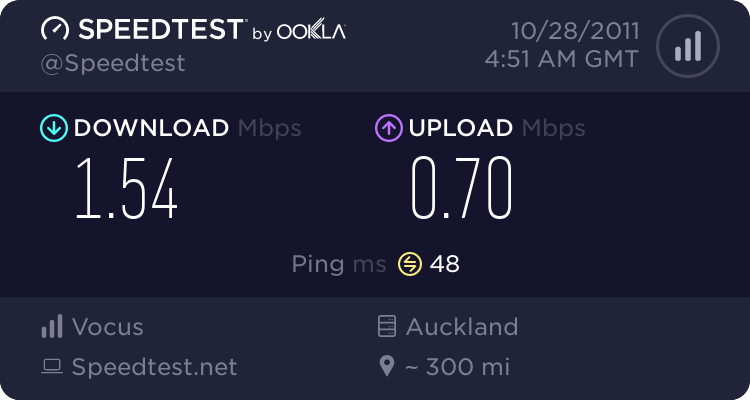 It seems a bit slow - do you have an ADSL or ADSL2+ connection? Is ADSL2+ available on this plan? The previous speed tests indicate they're both on ADSL1. Very keen to switch over as 100GB doesn't suit us (not even doing anything illegal, just a lot of Netflix HD streaming), one month left on contract with Telecom. Peppery: Is ADSL2+ available on this plan? The previous speed tests indicate they're both on ADSL1. Hi, yes, we support adsl2+ if your exchange supports it. AdrianD: Hi, yes, we support adsl2+ if your exchange supports it. Awesome, cheers! Any idea for how long this is running for (or if I can place an order in advance)? Our Telecom contract is up in December and we're looking to move everything over to Slingshot then. Can I get the new price as an existing customer? Im looking at signing up for this but when you do go to select broadband plan and Unlimnted option for $60 it still says below there is a 12 month contract. I called Slingshot call center about this and they said just ignore 12 month contract part, they have not fixed it on there web site. Is this correct seems a bit weird to be signing up for a non contract plan yet it says there is a 12 month contract.